What is the goal of any project management methodology? To eliminate waste and streamline processes. With that in mind, it’s easy to see why Six Sigma became so popular and why so many industries have scrambled to find ways to apply it. Who doesn’t like to accomplish tasks faster while saving money? However, if it's incorrectly applied, Six Sigma can do more harm than good because it isn't always a one-size-fits-all solution, and may limit flexibility for exceptions or unique circumstances. In the quest to refine processes and eliminate waste, Six Sigma may discourage creativity, hamper original design, and leave less room for innovative new tools or methods. Let’s review what makes up the process of Six Sigma, how to follow the Six Sigma steps, where the limitations of the methodology lie, and what methods or tools companies may want to use instead. The term “sigma” is a measurement of how far from perfect a system or producer can get—by Six Sigma standards, companies should reduce manufacturing defects to less than 3.4 per 1 million units. Businesses use the Six Sigma methodology to improve processes by identifying the errors that lead to defects and implementing new management systems once errors have been addressed. The methodology is most effective with repetitive, assembly line-style operations where individual steps can be isolated, examined, and improved upon. How is Six Sigma used? Originally developed for manufacturing, Six Sigma can now be found across many industries. However, just because companies in different sectors have applied this methodology doesn’t necessarily mean that these companies have used it correctly or effectively. Outside of a manufacturing operation, Six Sigma often fails to yield the kind of results needed to justify such a time-consuming and expensive management change. To function effectively, Six Sigma requires buy-in from everyone involved. It requires a sizable upfront cost to implement and train employees on the methodology of Six Sigma and its execution. Employees of all levels must be trained in the various positions of the methodology as well. Individuals who have completed a Six Sigma certification class earn belts to designate their level—Green Belts are for beginners, Black Belts are for project leaders, and Master Black Belts are for those in charge of implementing Six Sigma throughout the business. 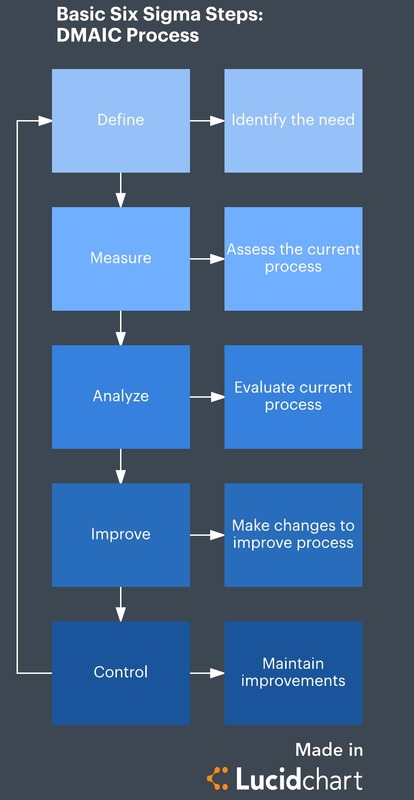 What are the Six Sigma process steps? The steps in Six Sigma are fairly direct and straightforward. Define the problem. Craft a problem statement, goal statement, project charter, customer requirement, and process map. Measure the current process. Collect data on current performance and issues. Verify that the data is reliable, and update the project charter as needed. Analyze the cause of issues. Examine the process and data that was collected, display the data, investigate and confirm what’s causing the issues, and continue updating the project charter as needed. Improve the process. Decide on solutions to fix issues and create process maps for those new solutions. Take steps to implement the new fixes and continue to measure improvement. Control. Refine the new process, continue monitoring, and use findings elsewhere in the business, if possible. The customizable templates available from Lucidchart are free to use and can be tweaked to fit any project. What are the limitations of Six Sigma? One of the challenges of the fact-driven process of identifying a problem and working toward a solution is that it tends to leave out a key component: humans—and more importantly, how humans impact and work through different obstacles. Sometimes it is often beneficial to give employees a chance to tackle issues head-on before investing in a complete operational overhaul. The one-size-fits-all approach to Six Sigma can also be somewhat limiting at times, especially within organizations or disciplines that rely on creativity. Employees who crave the freedom to toss caution (and sometimes process) to the wind in an effort to innovate may find the Six Sigma process stifling. Six Sigma also does not technically allow for the introduction of new tools or methods, even when they could be beneficial. Since Six Sigma generally requires total dedication across all teams, it’s difficult to use or experiment with other process methodologies for other areas of the organization. What can you use instead of Six Sigma? Waterfall: Uses sequential tasks that move toward a final product, with each step being completed in order. Create your own Waterfall template with Lucidchart. Scrum: Allows for small teams to work simultaneously on deliverables, testing and adjusting course throughout. Start building your own Scrum board today. Kanban: Relies on notecards to visually represent projects and track progress through stages. Learn more about Kanban project management methodology. Agile: Produces deliverables that are driven by customer needs, using iterative cycles to continuously refine until a final product is created. Find out how you might already be using the Agile method. Borrow from some Six Sigma principles and conduct a fact-finding mission, evaluating where your team is already successful, what’s working well, and what type of environment drives those ideal results. Does your organization do best in large teams or small teams? 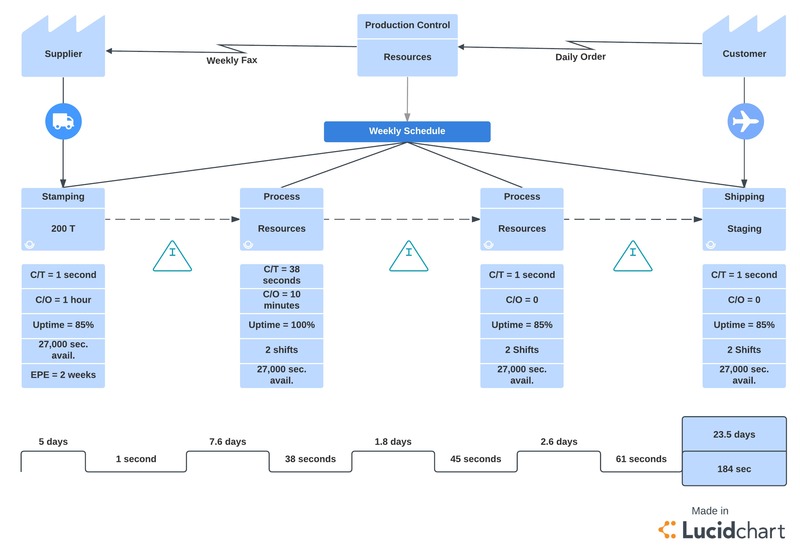 Do team members like two-week sprint schedules or more free-form processes? Use the information you’ve gathered as a guide to investigate which project management methodology works for your specific goals, constraints, and timelines. 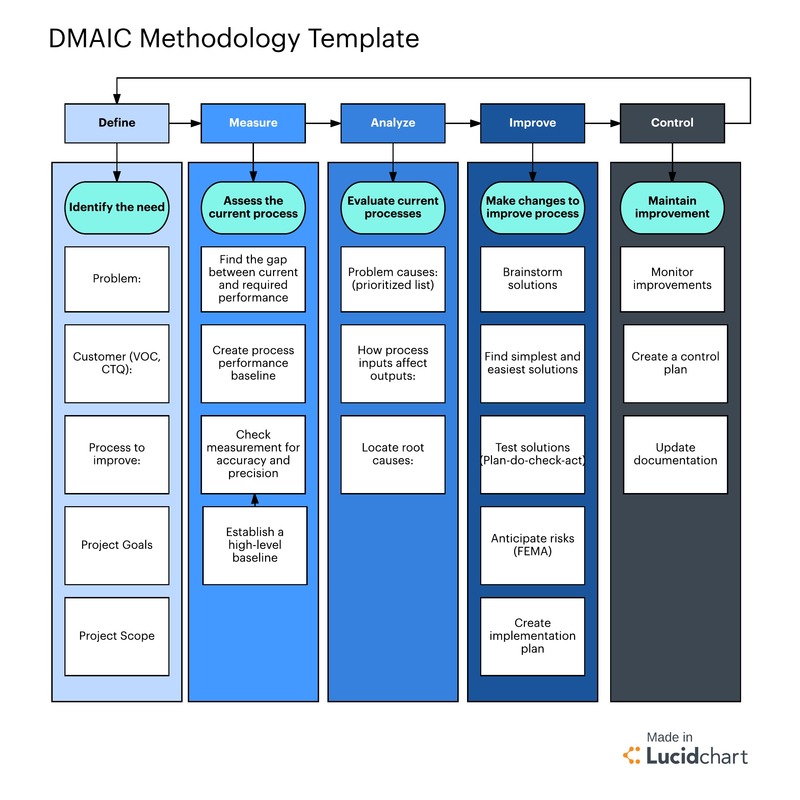 A helpful exercise in choosing the right project management process is to select your top two or three choices and then organize a potential workflow for each in a customizable diagram or template from Lucidchart. Keep track of the pros and cons of each type of project management style, and decide with key stakeholders which process makes the most sense for your unique situation. You don’t need to stick rigidly to the rules of just one project management process. Rather, be open to taking the best parts of different methods and using them to your advantage. Six Sigma should be recognized and celebrated for what it is: a data-driven approach to streamlining production and manufacturing. For industries and businesses outside of manufacturing, though, teams should explore more flexible project management or process improvement methodologies. For all its successes, Six Sigma can’t replace human ingenuity and hard work. Look instead to the brain power in your organization, and find a methodology that works with your team’s creativity and can be customized where needed.